The Philippine peso hit a fresh low on Wednesday, September 12, closing at Php54.13 against the US dollar, the weakest it has been in almost 13 years. The last time the Philippine peso was at this level was in December 2005, according to data from the Bangko Sentral ng Pilipinas (BSP). A study commissioned by online payment service PayPal revealed that half of purchases made by Filipino online shoppers are items bought from e-commerce sites based abroad. According to PayPal’s Cross-Border Consumer Research 2018, Filipinos spent an average of Php3,663 in online shopping last year, with a majority of that budget allocated for cross-border shopping. 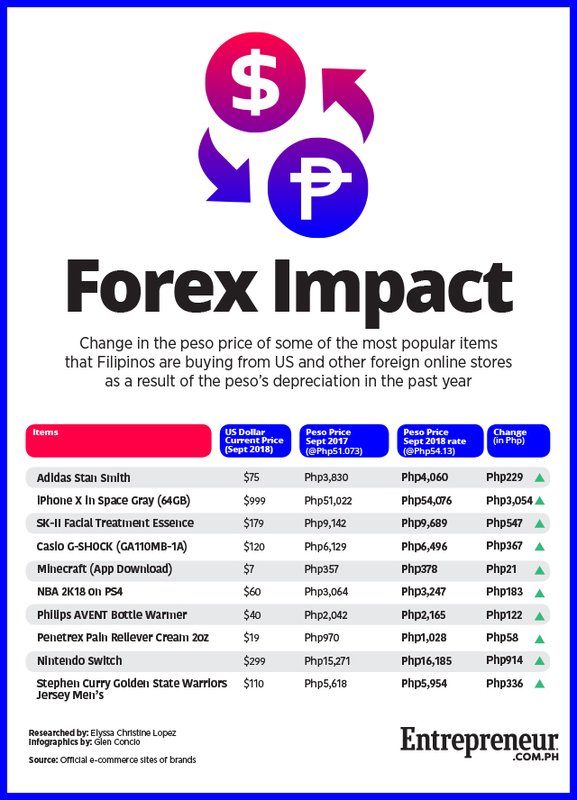 To illustrate how the peso’s fall will likely affect the cost, in local peso terms, of popular items bought from online stores abroad, we compiled a list of some of the bestselling items in Amazon.com, America’s biggest online store, under each major category. Next we estimated its peso value after the peso fell below Php54/$1 and compared that with the item’s peso cost based on exchange rates the year before. The peso price increases may seem marginal for lower-priced goods, but for premium items, the changes can be significant. For the apparel and footwear category, for example, the bestselling pair of Adidas Stan Smith, which retails for $75 in its official website, would only cost around Php3,800 if it was purchased last year. But with the weakening performance of the peso, a pair now costs over Php4,000. An iPhone X which has a price tag of $999 on Apple’s official website would now cost the Filipino consumer Php54,075, a few thousand pesos more than how it would have cost last year at Php51,021. And peso price increases show no signs of abating. The Philippine peso is expected to dive further before the year ends as analysts await for BSP’s mandate on the overnight borrowing rate. It increased the rate by 50 basis points in August, raising it to four percent as a means to curb the rising inflation rate, which hit 6.4 percent in August.